If easy decadence is a thing, this is it. Only six basic ingredients, and almost as easy to throw together as a mix from a box–but the flavor is on another level. 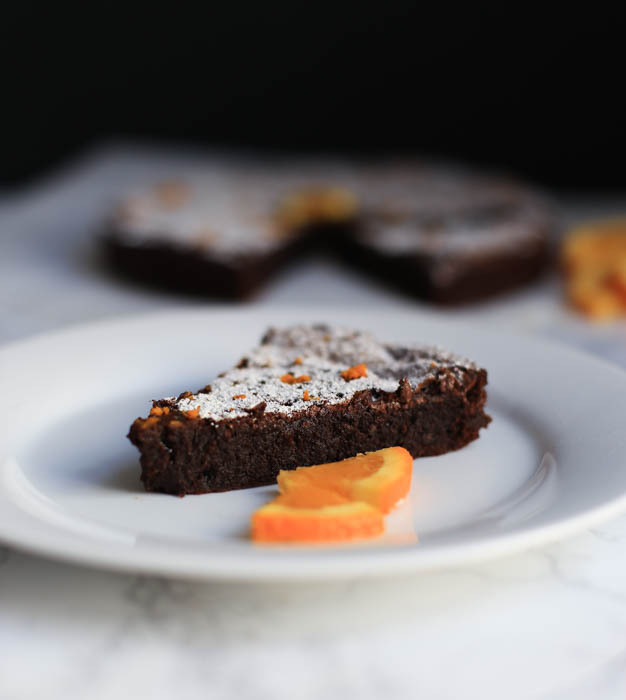 This flourless chocolate cake is rich and wonderfully fudgy, but not too heavy. 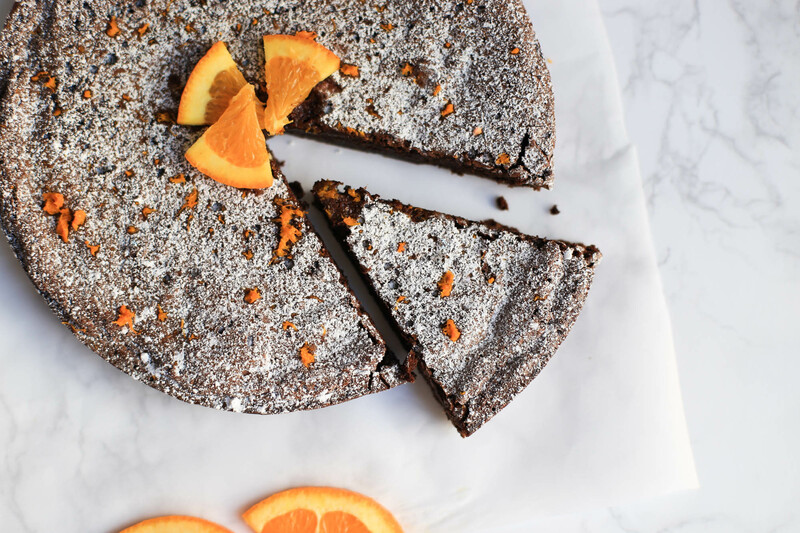 Whether you are a beginner in the kitchen or a veteran baker, this chocolate cake is for you. This recipe is definitely not one I crafted out of thin air. It is from the Gourmet Today Cookbook. I first tried the recipe for my monthly Cookbook Club. It’s like a book club, but instead of a regular book we choose a cookbook/food blog and all make a recipe from it, then bring it to the gathering. It basically rocks. (Keep an eye out for a full Cookbook Club post!) 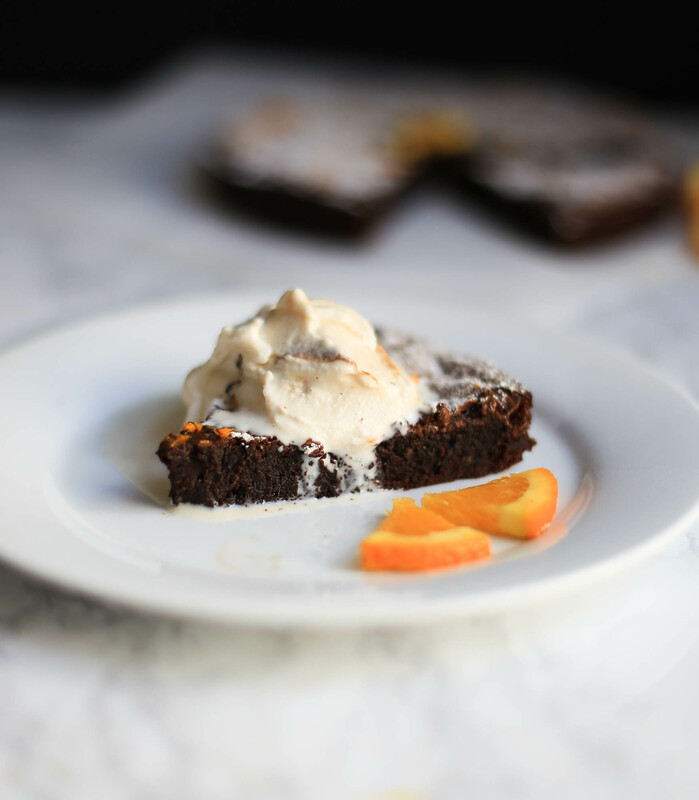 This flourless chocolate cake was a huge hit for dessert, and I added my own twist by using flavored chocolate. Best idea, perhaps ever. You know those fancy bars of chocolate at the store that are labeled INTENSE orange or pomegranate or raspberry? Yep, that’s what you want for this recipe for an awesome, bright punch of flavor. 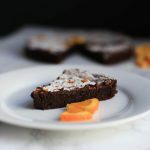 Please do feel free to use regular bittersweet baking chocolate, but I believe using the Lindt Orange Chocolate bar takes the recipe to the next level (#notsponsored). The level where people ask you how on earth you made this cake and you just say I mixed stuff in a bowl and baked it. I also served a very thrown-together version of this cake at our Boston dinner party last November. Since then, I have had requests to post the recipe and I am happy to say this is the improved version. The cake is still pretty thin (being flourless and whatnot) so if you are feeling really decadent and ambitious you could double the recipe. I personally get enough richness from the single layer. Homemade cakes don’t get much easier than this one. Chocolate and butter are melted together, and the other ingredients are slowly added in. I believe whipping the egg whites gives the flourless cake more structure, but it’s really an optional step. You will be able to tell when the cake is done baking when a thin sort of crust has formed on the top. And the cake can be served warm or chilled, so you can prepare it ahead of time. A bit of powdered sugar is all this is needed to decorate. I added a little orange zest for effect as well. Fun tip: if you want to make a decorative shape with the powdered sugar, cut the shape out of pieces of parchment and place on the cake. Then dust it with powdered sugar, remove the parchment and voila! The shape will be there! I am definitely trying this next time. Maybe this (ha, not.). Or use a doily. Pinterest is obviously full of ideas, but don’t go there unless you are ready to dive into the rabbit hole. Place the oven rack in the middle of the oven. Preheat the oven to 350 degrees F. Butter an 8-inch round baking pan. Cut out a piece of parchment paper to place in the bottom of the pan, and then butter the parchment paper. 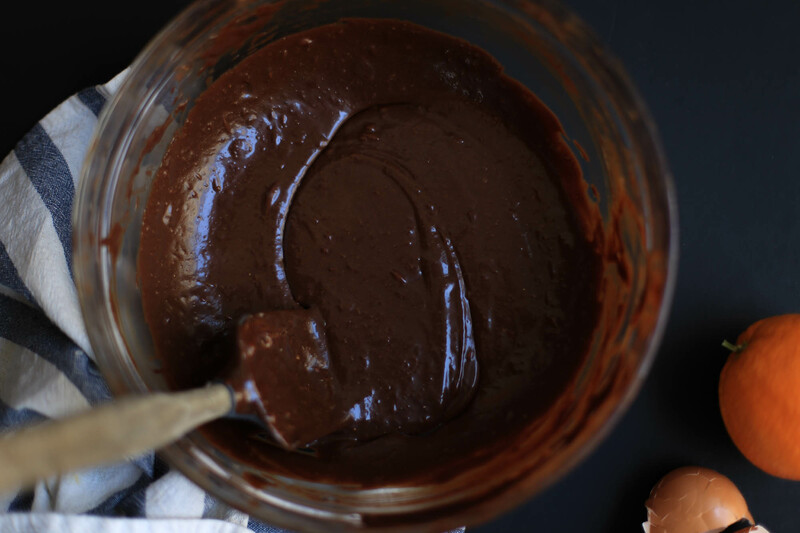 Melt the chocolate and butter in a large glass bowl in the microwave. Whisk in the sugar. Let stand for 5 minutes to cool, and then whisk in the egg yolks. Sift the cocoa powder and salt into the chocolate mixture and stir to combine. In a stand mixture, beat the egg whites at high speed until peaks form. Gently fold into the chocolate mixture until combined. Pour the batter into the baking pan. Bake for 30-35 minutes, until a thin crust forms on the top, before the sides pull away from the edges of the pan. Place the pan on a cooling rack and let cool for 5 minutes. Invert the cake onto a flat plate and then reinvert onto the cooling rack. Let cool before dusting powdered sugar on top. Top with orange zest if desired.